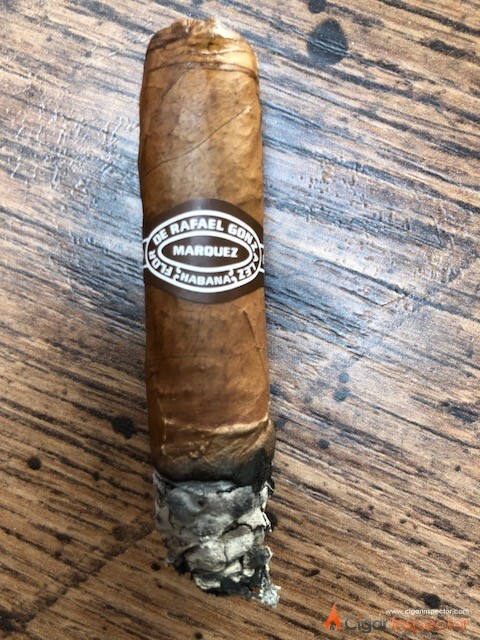 Before you start reading our new quick review of the Rafael Gonzales Perla we want to share with you another review of the same cigar made few years ago by Sean, click here! I was not very excited about this Rafael Gonzales cigar. The main reason is that I have always heard from great collectors this brand needs some ageing before really expression the blend’s full potential. This cigar comes from a box of 2017. At first the draw it not completely tight but not slightly resistant, in between these two feelings. The burn is actually very good and impressive for such a little cigar. 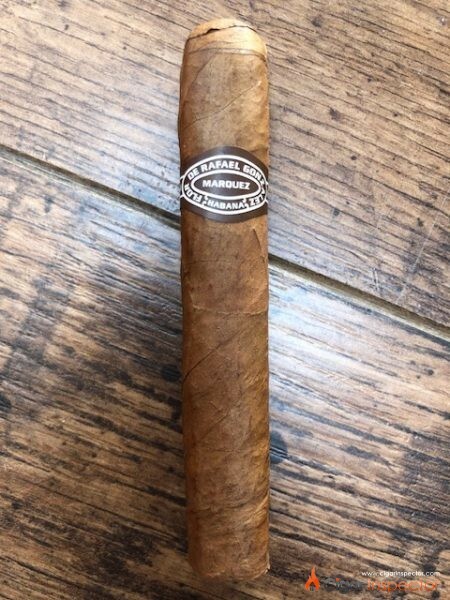 We always think this little cigar, forgotten by most of us are being rolled rapidly without care but the first part the construction just improved very quickly and the perfect burnt allowed a great solid ash to form. The aroma is a bit harsh at the very beginning but loads of smokes are coming out of the puffs. It is very enjoyable. Some surprising notes of burn provençal herbs are coming out of this cloud. On the palate, some great smoked spices are developing. Quite complex for such a little cigar. The strength is very light and density of smoke high. This makes it such a soft feeling. The cigar evolves slowly to a woody structure. Sometimes hints of sweetness reminding you a the creaminess we all know in our cuban cigars come out. The end of the first part shows very Hhigh ammonia taste unfortunately. Hope it will change as the beginning was great. The finish on the palate is extremely short. Almost with the feeling of not having smoked. The second part doesn’t Strat very well. kind of flat flavours… It is hard to say and almost rude for the great Habanos that we love. Nothing very special slight roasted coffee bean. The aroma is much more interesting with this grilled herbs notes. I never experienced such an aroma I have to say. Very confusing, in a good way. The woodiness is well perceived but the finish is very short which makes it a very easy cigar to smoke. The last third starts well with lots of oriental spices and the one I could recognise easily was the cumin. This is a surprisingly complex cigar. The creamy structure comes and goes but when it’s here, makes it such a lovely cigar. Not a bad little cigar, I wasn’t expected this. I have to admit the cigar isn’t really balanced and a bit of age won’t harm it. But having smoked some delicious aged cigar and now this fresh one I understand why they age so well. This Rafael Gonzales Perla is like young racing horse, going everywhere and hard to control. A bourbon type of flavour appears in the very last part. Still with some bitterness on the back of the tongue though. the last notes are extremely good, chocolaty and creamy texture, round not aggressive as it felt since the beginning. Short smoke and getting tastier toward the end. The problem I encountered with this cigar was 20 minutes after the after taste was really bad and this killed the entire enjoyment I had. Therefore I believe it should be an aperitif cigar before pulling out the big cigars.